An 18-year-old Mutoko man has succumbed to cholera, with four others currently admitted as the country records a fresh outbreak of the medieval waterborne disease. Mashonaland East provincial Epidemiology and Disease Control officer Paul Matsvimbo confirmed the fresh outbreak yesterday and said government had since set up two treatment camps in the area. "I confirm the death of an 18-year-old male adult in the Rukanda area, about 15km from Mutoko Centre. We received a report of a suspected death by cholera from a village health worker. Our team then took samples, tested them and it came out that he had died of cholera. Currently, three members from the homestead are admitted and recovering well after testing positive to cholera," he said. "Another person from the area is admitted as well. We have set up two treatment centres, one at Mutoko Hospital and another near the homestead. We are happy with the support we are getting from partners like World Health Organisation as we work flat out to combat cholera." The fresh outbreak comes barely a month after the death of eight people in the Nyamutumbu area of Murewa, who contracted the disease at an apostolic shrine. The deceased were all members of the Johanne Marange Apostolic sect. Matsvimbo said 35 cases of cholera had so far been recorded in Nyamutumbu and government had since engaged partners from the Christian community for awareness campaigns. "As of January 24, we have 35 line cases, including eight deaths in Murewa. We are working in partnership with organisations like Evangelical Fellowship of Zimbabwe and Higher Life Foundation, among others doing hygienic awareness campaigns in the affected area. A borehole has since been drilled at one of the shrines. Some of the sect members were trained to become hygiene champions," he said. 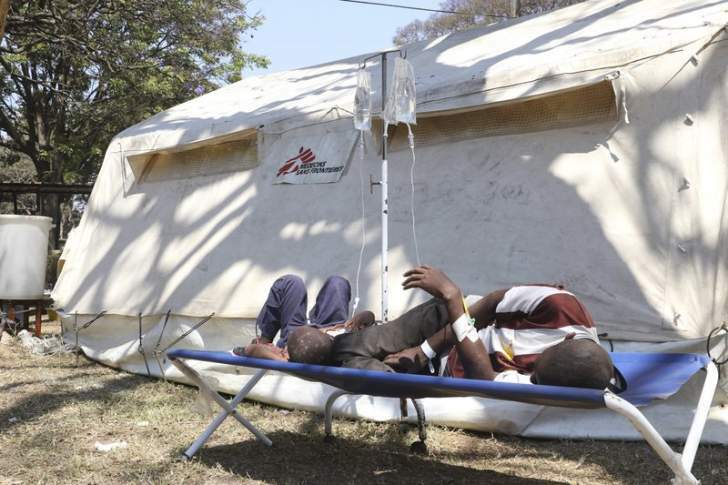 An estimated 100 people have succumbed to cholera nationwide, with Harare topping the list since the first outbreak last year.